Fiverr’s a great place for a side-hustle or even to earn a full-time income. But to do that, you’ve got to get people to view and book your gig. Buyers have plenty of choice on Fiverr, because there are tens of thousands of service providers. So, how do you make sure your gig gets the most clicks? It’s pretty disheartening when you create a gig and there’s virtually no response. But the truth is, you CAN make money on Fiverr—you just have to prime your gig for success. If you’re starting from scratch, there are ways to make your gig stand out above the rest. Even if you’ve already got a Fiverr account, and have set up your first gig, there’s always room for improvement, right? You can use the tips we’ll share to make it better, and more successful. Here’s how you start getting attention and making money. 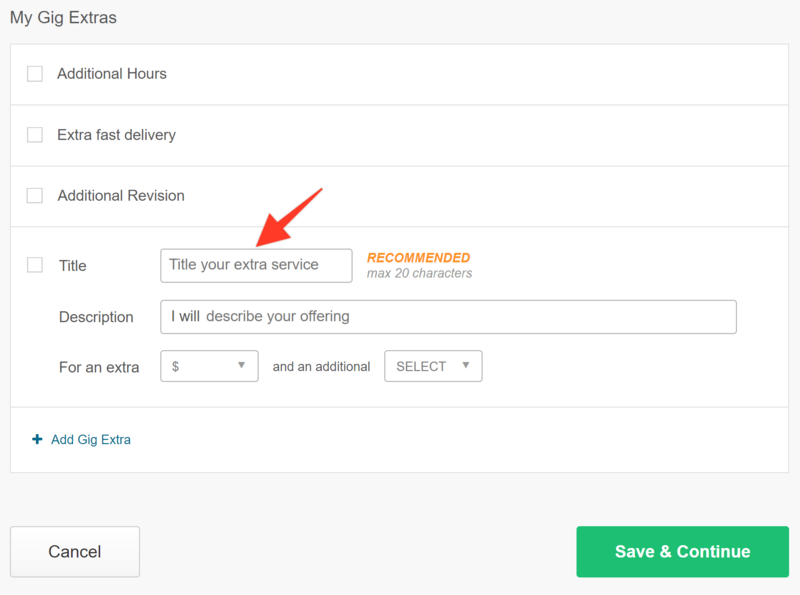 When you join Fiverr as a seller, the first thing they tell you to do is create your own gig. But before you pick the first category that pops into your head, take some time to work out your ideal niche and the services you’re going to offer. To do that, you’re going to look at Fiverr the way a buyer would. You can do that easily by clicking the Buying link in the navigation menu. 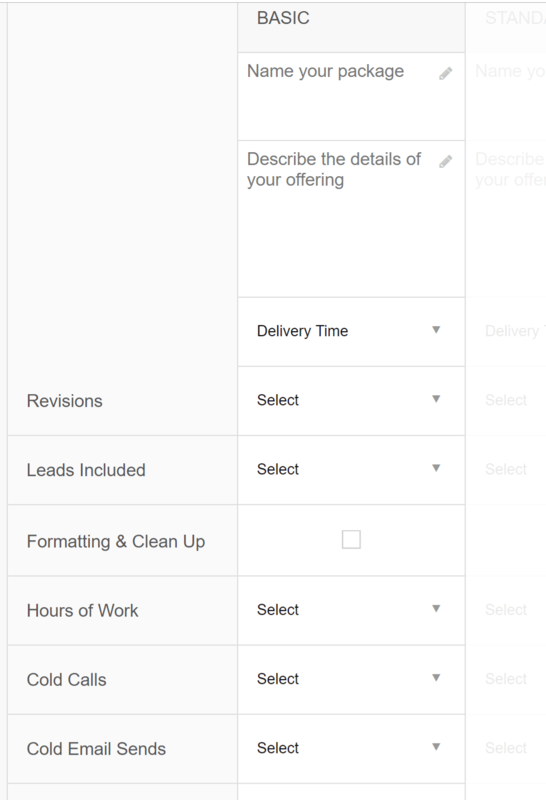 After that, use the menu buttons at the top to find the main category that matches the services you want to offer. Hover over any link, and you’ll see a submenu with subcategories. Explore these in detail so you can pick the perfect one for your gig. When you click on a subcategory, pay attention to the menu on the left of the page. This has further refinements, and gives you an idea what buyers will look for when choosing your services. Use these to create a shortlist of what you’ll offer to buyers when you create your own gig. Once you’ve refined what you plan to offer, the next step is to see who you’re up against. When you’re in a subcategory, the default view shows recommended service providers. But many buyers will be more interested in who’s got a good track record—these are your competitors. To find them, change the default view from Recommended to Bestselling. This will tell you which gigs are already popular, and give you a sense of what kind of service you have to offer in order to make yours equally popular. Scroll down to the end of their gig description, and check out the keywords they use to describe their gig. Make a note of these for when you create your own gig. Do this for multiple sellers till you feel you’ve got a handle on what buyers in your niche really want. Then it’s time to switch back to the Selling interface and start setting up your Fiverr gig. With thousands of providers to scroll through, buyers will use the gig title as a handy way to decide which gigs are worth their time. So it’s important to highlight your unique selling point and say what’s in it for them in the 80 characters you have to title your Fiverr gig. Use adjectives to describe your service. Most sellers say their services are professional, but if you add some emotion, then your title stands out. In the example below, one video seller offers a “breathtaking” video. Include an additional related service. For example, with video, you can add that you do post-production. Add your delivery time. If you’re going to deliver your product or service within 24 hours, it’s worth mentioning in the title. Pick your gig category. Fiverr will recommend subcategories based on your choice, but use the research you did earlier to choose the subcategory where you can compete effectively with other sellers. While you’re there, select your gig metadata. These are other filtering options for your gig, as described in our first step. Finally, add the tags you identified from your earlier research. You can choose up to five. Remember, subcategories, metadata, and tags will show up as filtering options for buyers, so choose wisely. As Adam Warner points out in How to Post a Gig to Fiverr, using three packages in your Fiverr gig can boost earnings by as much as 64%. So it’s definitely worth doing. After you title your gig to show what’s offered, you have 100 characters to create a catchy description for each gig package. Set your price for each package anywhere between $5 and $995. Pro tip: Consider pricing your services low at the start to attract more buyers. Fiverr has a level system based on the number of orders you do and the reviews you get. The higher you progress, the more visible and successful your gigs will be. Once you’ve moved up a level, and have multiple five-star ratings and reviews, you can raise your prices. Again, possible gig extras vary depending on the subcategory for your gig. You can also create your own. Finish up your description by adding some FAQs about your service. If you’re not sure what to put here, go back to those bestsellers you looked at earlier, and check out the questions their buyers ask. Then reframe those and add your own answers to create an FAQ section for your gig. One the next page, tell buyers what you’ll need to deliver the gig. For example, if you’re creating a logo, you’ll want to know something about their brand. And if you’re writing content, they’ll need to give you information about their audience. One of the best ways to have a successful Fiverr gig is to make sure more people see it. 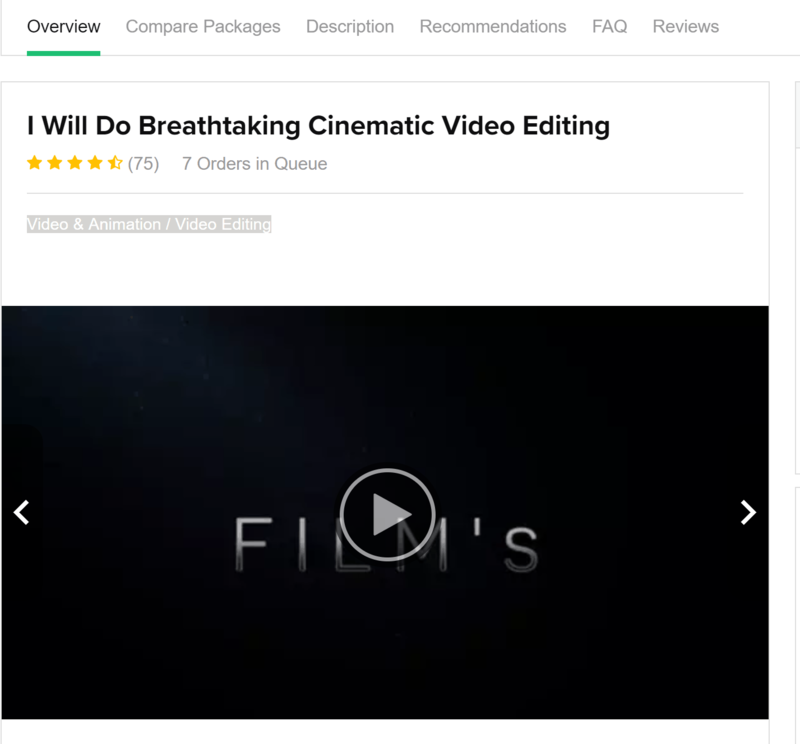 Fiverr says creating a gig video can increase visibility by up to 200%. Share your gig on social media. Whether you’re on Facebook, Twitter, LinkedIn, Instagram, or another network, letting people know that you have a gig on Fiverr is an excellent way to prime it for success. Consider setting up a drip marketing campaign with a tool like MissingLettr for even more gig visibility. 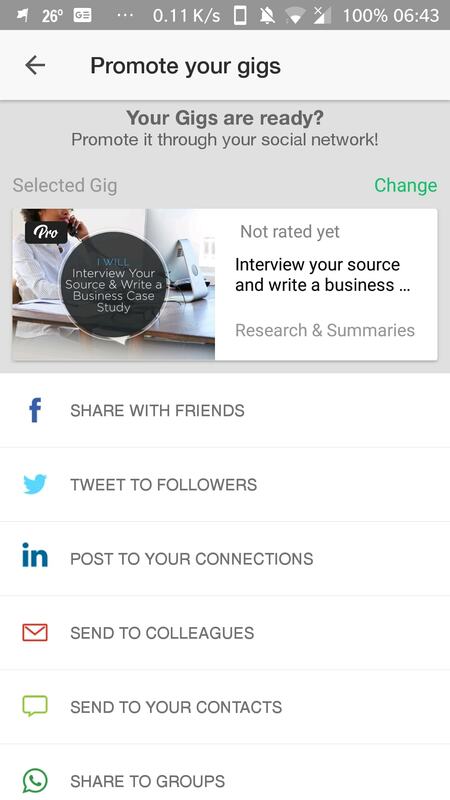 Download the Fiverr mobile app. This makes it even easier to share your gig on social media, and you can share via mobile messaging networks like WhatsApp, too. Just go to the “Promote Your Gigs” section of the app to access this feature. Use Quora to drive traffic to your gig. This is something Fiverr recommends. 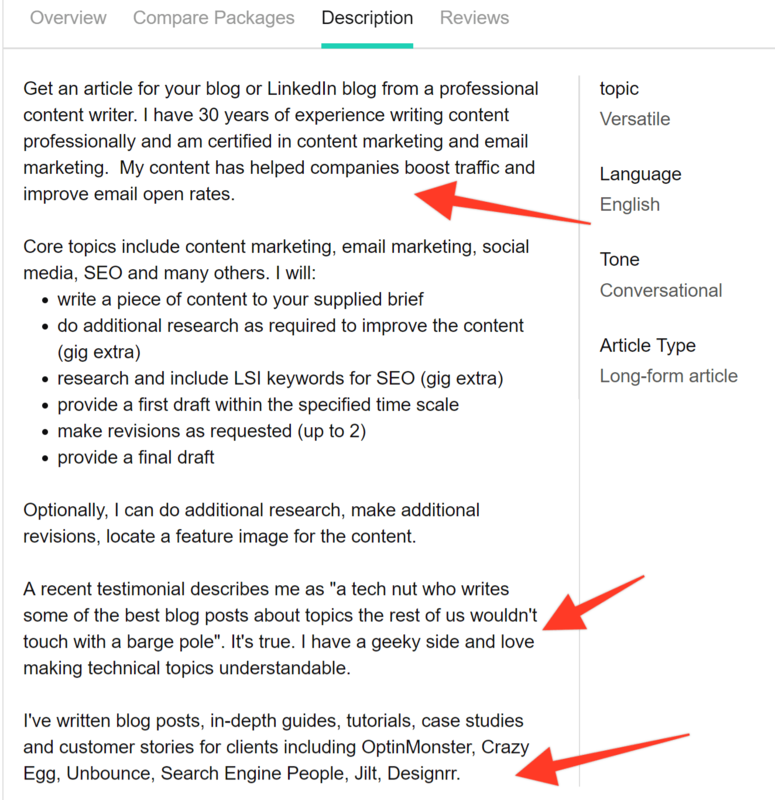 Options for using Quora include blogging and answering questions related to your gig. You can also include your gig link where appropriate in your Quora profile. Use social ads to promote your gig. Facebook is a great place to do this, as it’s got an audience of more than two billion. You can reach people interested in your services by spending as little as $10 or $20. You can also consider advertising to businesses on LinkedIn, as many might be looking for affordable business services. As you can see, creating a successful Fiverr gig isn’t just about the gig itself. Instead, it’s about what you do before and after you create the gig. Doing competitive research in advance helps you create a gig that’s designed to appeal to your target buyers. And promoting your gig to your own networks and beyond extends its reach so you can attract more business. Now, it’s over to you to create your own successful Fiverr gig. Sharon Hurley Hall is a professional writer and blogger. Her work has been published on Jilt, OptinMonster, CrazyEgg, GrowthLab, Unbounce, OnePageCRM, Search Engine People, and Mirasee. Sharon is certified in content marketing and email marketing. In her previous life, Sharon was also a journalist and university journalism lecturer. You can learn more about Sharon on SharonHH.com.